I finally crocheted a full garment for the first time! Yay! After branching out from amigurumi this past year to make wearables, I have advanced to making an entire sweater. I started off with just making cowls, scarves, and hats (mostly for Christmas gifts), but then I saw the sweater pattern “My Favorite Crochet Pullover” by KT and the Squid (on sale!) and knew I had to make it next. The pattern was very easy to follow and simple, so great as my first sweater. The yarn was also inexpensive, so I didn’t feel too much pressure to create a perfect sweater simply because the yarn cost me $100. I would recommend it to anyone else who is ready to take the plunge into crocheting larger clothes items. I made my sweater in size small using Lion Brand Heartland yarn (as recommended) in Joshua Tree #174 and Yellowstone #158. I know I have said this before, but I love, love, love the Heartland yarns. They are so soft, the colours are rich, and they wash-up nicely (well, to be honest I have only washed my gauge swatch, but it came out nice!). I still need to test how the yarn will fair with multiple wearings and washings, but I am hoping it will pull through. Despite the pattern being simple, I still learned a few things along the way. It is always great when a pattern introduces me to new techniques that advance my crochet skills. Most of the sweater was made using a stitch I had never seen before: the herringbone double crochet stitch. It was used throughout the sweater and created a nice slant to all the stitches. I also learned how to start the piece with foundation single crochet stitches, which meant my initial foundation chain and first row of stitches were crocheted at the same time. With this technique you do not need to worry about a tight foundation chain, which is important for most items, but especially when that chain is around the neck of a sweater. For both new stitches there was a link to a video included within the pattern, so they were very easy to pick up. 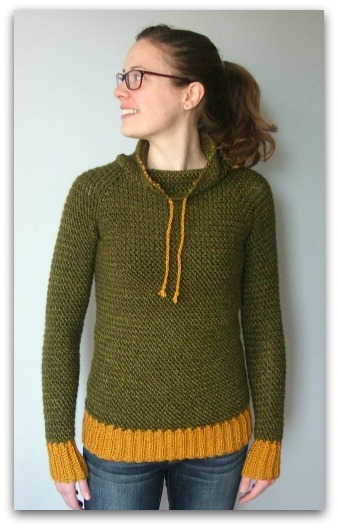 Two other techniques I learned while making this sweater (again, with instructional videos included in the pattern) were a ribbed trim (the yellow arm cuffs and bottom trim of the sweater) and a twisted cord (the yellow drawstring around the cowl). Both of these techniques are useful and I am glad they have been added to my arsenal of crochet skills. The sweater does stretch quite a bit and I will need to wear another top underneath, but this is not a problem (especially in cold Montreal). 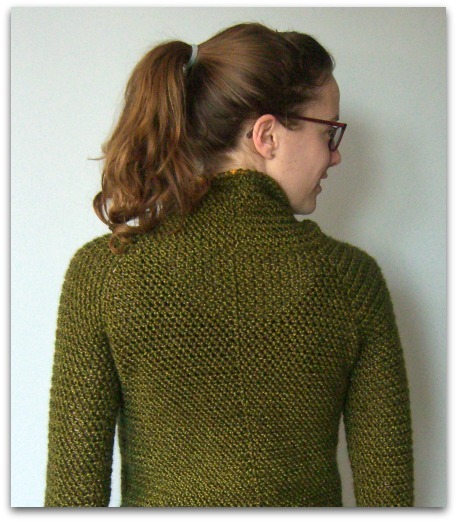 The seam created when joining each round is visible, but it is straight down the back of the sweater and I think it adds to the design, creating a nice effect, rather than being an eyesore. I am so happy with the results and now I am inspired to crochet more of my wardrobe. My next project will probably be a nice lace tunic for spring and summer. Any suggestions for a pattern?